Description: An enchanting wooded lane leads you to total privacy amid beautiful trees! 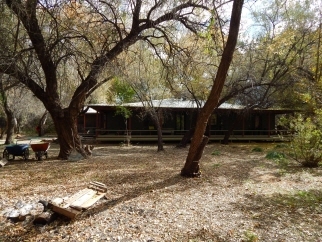 Northern nm-style home on 1.5 beautiful acres with wrap-around porch in front and large deck in back. This custom home is cozy in the winter with forced air heat plus a wood-burning stove and a pellet stove. Home has an attached apartment with 400 sf, kitchen and a full bath. Large attached storage room/studio plus a detached multi-purpose building formerly used as art studio and a large bird/chicken building. Sunroom is 7x17 and is not included in square footage. Completely fenced and zoned for horses. Irrigation available. Great location and close to all city conveniences.